Technology Marketing Corporation has named the Packet8 Tango Video Terminal Adapter a 2007 TMC Labs Innovation Award winner. According to Tom Keating, CTO and TMC Labs Editorial Director at TMC, "The Innovation Awards exemplify the best and the most unique products and services that this industry has to offer. 8x8, Inc. has demonstrated a commitment to quality, and a commitment to the further development of the IP communications industry through its Packet8 Tango VTA. 8x8 deserves this great honor, and I look forward to seeing other innovative solutions from them as they continue to contribute to the future of IP communications." The Packet8 Tango VTA, introduced in January 2007 at the Consumer Electronics Show, takes the concept of traditional VoIP terminal adapters one step further with the addition of advanced H.264 video. This sleek-looking 8 1/2" x 5 1/2" x 1.38" free standing device incorporates a built-in, high resolution 5" LCD color display and 180 degree rotating CCD camera to deliver advanced full-motion video at up to 30 frames per second along with crisp, delay-free audio. In addition to unlimited local and long distance calling to any U.S. and Canada phone number, Packet8 Tango users receive unlimited worldwide video calling to any Packet8 video-enabled endpoint, i.e. 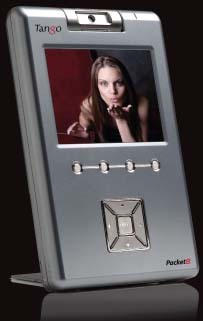 another Packet8 Tango, the Packet8 DV326 desktop videophone or 8x8's voice and video softphone, Packet8 Softalk. Raketu announces that its RakWeb VoIP telephony services are available for use on mobile devices. Consumers who use mobile devices like the Nokia E70 that run on the Symbian operating system, Mobile Windows Smartphone models 8125/8525, and Linux-based mobile devices like the Nokia 770 will now be able to access RakWeb from their mobile handsets. RakWeb is entirely web-based and does not require consumers to download any software. Consumers simply visit www.Raketu.mobi from their mobile device Web browser, enter their mobile number, then enter the destination number, and Raketu connects the lines at a fraction of the cost of traditional calling rates. MOBIVOX will offer to anyone who is registered to the service $10 worth of free international VoIP calls from anywhere in the United States this July 4th. MOBIVOX's Independence Day promotion is a way to connect friends and family separated by oceans, continents or simply national frontiers who can't make it to Fourth of July picnics or barbecues, and to thank its growing user base for choosing the MOBIVOX service. Users will be able to make their free calls to anywhere in the world on mobile or fixed lines anytime from midnight EDT to 11:59:59 pm EDT July 4. MOBIVOX is now available in 29 countries at www.mobivox.com. fring announces that it has further expanded its mVoIP (mobile VoIP) community by adding all Windows Mobile 5.0 and 6.0 series devices to its list of compatible handsets. Now fringsters can choose to communicate for free between fring, Skype, Google Talk, MSN Messenger, hundreds of SIP providers and twitter on about 300 Windows Mobile phones and pocket PCs in addition to 20+ Nokia devices over any 3G, GPRS or Wi-Fi Internet connection. In its continuing endeavor to provide its subscribers with more calling capabilities for their money, PCCall is pleased to announce the availability of the Lucky 7 Calling Plan. This VoIP talk plan allows people from almost anywhere in the world to use their computers to call any seven numbers in seven countries. The fixed price for this all-inclusive package is just $7 per month. Customers who enroll in the Lucky 7 plan are also able to place unlimited calls to other PCCall members' Lucky 7 numbers at no additional charge. Lucky 7 numbers can be located virtually anywhere in the United States, Canada, China, the United Kingdom (landline), Spain (landline), Sweden (landline) and Singapore. According to VoIP Review, "consumers are paying an average of $24.96 per month for VoIP service." A recent "New York Times" article further revealed that even traditional landline subscribers have seen their residential bills grow by over 64 percent in the last decade. Compare those figures to the Lucky 7 Calling Plan's fixed monthly fee of $7, and the savings are obvious. JAJAH announces its "No Headset" campaign and Web site, using the slogan "If You Liked Skype, You'll Love JAJAH." The "Skype alternative" campaign is designed to make the public aware that there is no better way to make free and low-cost global and long-distance calls than with JAJAH. JAJAH is rewarding users who try the service and switch with official über-cool, "No Headset" wear if they creatively dispose of their existing computer headset. Headset-weary visitors can go to www.noheadset.com to watch the videos and get program details. Now available to businesses of all sizes, VoIP is experiencing rapid market adoption, offering the ability to reduce costs, improve productivity and streamline network management by converging voice and data communications over a single IP network. However, investigating and understanding the options available and deploying VoIP technology can be a challenging undertaking for many small and medium-sized businesses. To help information technology and telecommunications managers address this issue, XO Communications has developed two new educational resources: The XO webcast "What Every Small and Medium Sized Business Should Know About Implementing VoIP" and companion XO white paper, "Ten Steps to a Successful VoIP Implementation: What Every Business Should Know". These resources outline the various factors that should be considered in determining when and how to implement VoIP as well as what type of VoIP solution is best for varying business needs. The webcast and white paper are hosted and authored by Tom Cross, a telecommunications industry expert and member of the Board of Technical Advisors for the VoIP Security Alliance. Cross is also founder and president of TECHtionary.com, the world's first and largest animated library on technology. VONaLink DialBridge now supports Skype. Previously, DialBridge supported VoIP systems based on SIP only. Directly making a long distance call from a cell phone, especially international, is so expensive that it is unthinkable. With DialBridge, cell phone calls can be routed through Skype to benefit from low SkypeOut rates. DialBridge software runs on a personal computer, along side the Skype client. When a user calls his or her SkypeIn number from a cell phone, DialBridge connects the call to the configured SkypeOut number. Up to 10 SkypeIn numbers may be mapped to SkypeOut numbers, and changed at any time. Optionally, DialBridge could do a callback so that instead of a long outgoing call from a cell phone, the call is turned into an incoming call, allowing the unlimited incoming minutes of a cell phone plan to be used. T-Mobile policy decision denies access to cheap calls and leaves T-Mobile isolated among mobile operators. Other mobile operators have employed different methods to prevent VoIP uptake. There has already been the well-publicised removal of internet telephony functionality from Nokia's popular N95 handset by Vodafone and Orange, and new data tariffs published by Vodafone that mean customers using VoIP will be charged more than for web browsing or email. The BT Business Club launches a guide to understand VoIP, within their ongoing "Understanding..." series. It is aimed at helping companies get the most out of technology and explains how businesses can take advantage of VoIP services. Get BT's "Understanding VoIP". BroadSoft will host the inaugural Southern Europe VoIP Leaders Summit in Milan on 20 June with partners Acme Packet, Polycom, BEA Systems and the Savatar research firm. Voice over IP (VoIP) promises many benefits, but moving the phone service to an IP network can expose that service to a number of serious threats. This 10 minute podcast looks at just some of these threats. With over 23 Million downloads and 3.5 million active users covering 187 countries across 7 continents, Globe7 has moved ahead to meet the communication and information needs of their clients. Globe7 is established as the world's No-1 VoIP provider integrated with Free Videos, Free PC-to-PC and the lowest priced international calling rates to any landline or mobile telephone. Subsequent to Globe7’s huge success on the Windows platform, the Company is now ready to launch for multiple platforms, which includes: Windows XP, Windows Vista, LINUX, MAC, Windows Mobile, and Pocket PC. Revolabs introduces the company's new xTag Microphone System. Featuring Plug and Play USB connectivity to personal computers, the Revolabs xTag Microphone System facilitates unparalleled freedom of movement by way of its clip-on, wearable design-bringing breakthrough wireless audio performance to the individual workspace. Featuring full duplex audio, eight hours of talk time, and a range of 20 meters (66 feet), the new xTag microphone is ideal for VoIP, SKYPE, podcasting, voice recognition, web conferencing and many other desktop applications. The xTag Microphone System consists of a base station, two-way audio (full duplex) xTag microphone, an earbud, a lanyard, plus a USB cable for interconnection to one's computer. The xTag's base station serves as both charger and wireless relay into one's personal computer. Featuring digitally encrypted audio, the xTag Microphone System is also an ideal solution for keeping one's conversations secure. Revolabs' new xTag Microphone System is compatible with both the Windows and Apple Macintosh operating systems.